This entry was posted in Birds Without Words and tagged animals, bird watching, birds, chickadees, nature, photography, robins, wildlife. Bookmark the permalink. Why thank you. I enjoyed watching the two of them share. My Robins can be bullies, so I was surprised to see him letting the little guy get a drink. Nice photo, we know which one of the pair will be the trouble maker. Indeed! 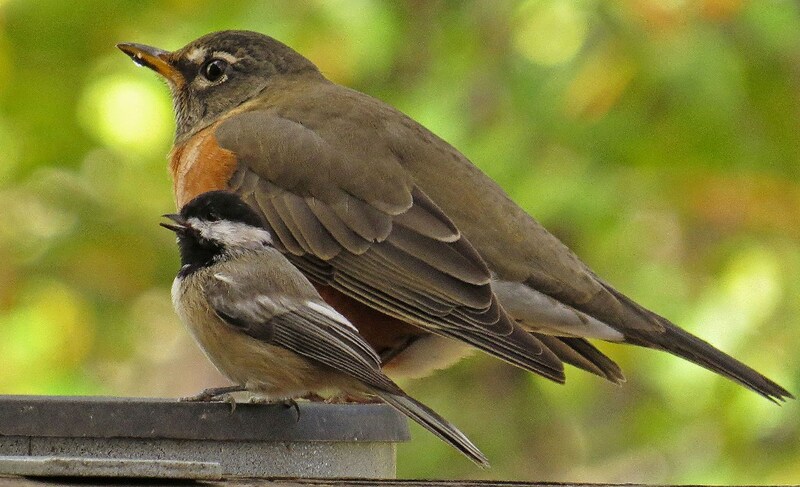 The robins here seem to be fine with the chickadees, but they hate the bluebirds. What a neat photo…really puts a chickadee’s size into perspective! Thanks. It was a fun photo to get. I never know if my robins are going to be bullies or not! What a contrast. That is quite a shot!